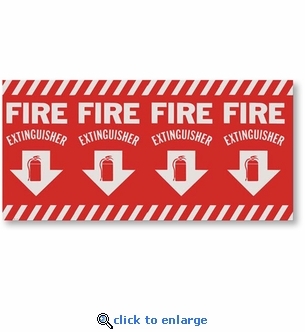 Wrap-around self-adhesive vinyl fire extinguisher location signs for use on square or round posts, poles and pillars. Quickly identify your fire fighting equipment locations from all directions in the event of an emergency. These vinyl self-adhesive labels are silk screened with UV inks, then clear laminated for durability and fade resistance. For small quantity orders (10 or less) select USPS Priority Mail for best shipping rate.